Singapore-headquartered indoor location startup YFind has taken its first step to expanding into a global business after it launched a retail analytics application, with the intention of cracking the US market. 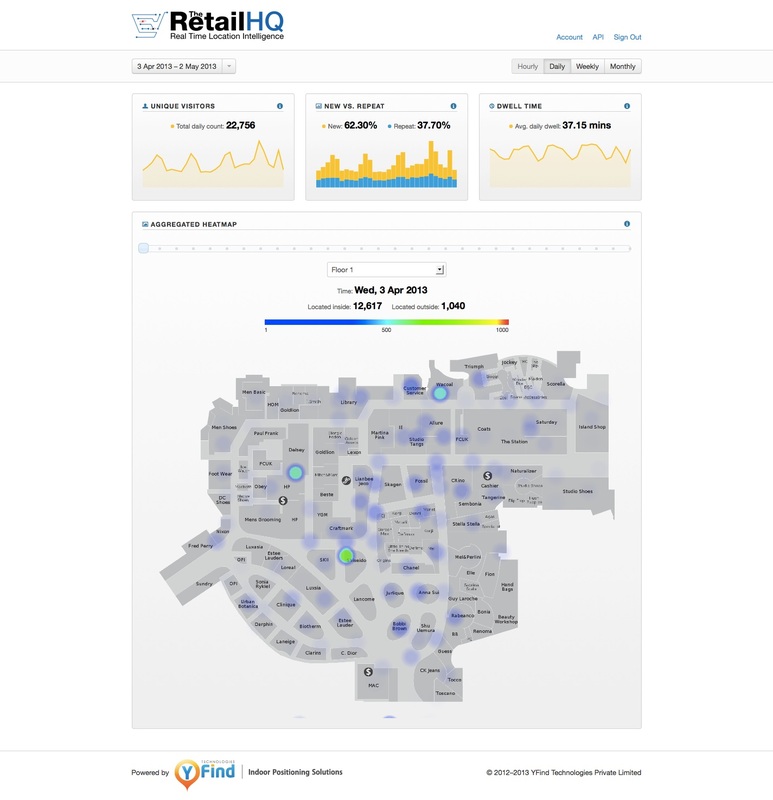 The company, which maps and tracks indoor locations to within three feet using its WiFi-powered technology, has launched TheRetailHQ service which helps retailers glean information about their customers. Since it uses WiFi and not cellular signals, customer data can be captured by the service without the need to download an app or any other software, removing one potential barrier for insight. 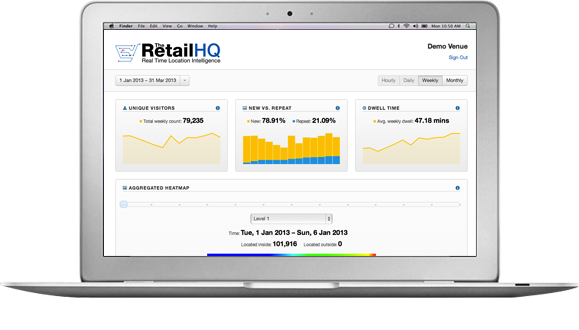 Offering a dashboard approach, the service allows retailers to gain insight about where customers are spending time on the store floor, helping them to assess what retail layouts are working, as well as identifying regular customers and tracking their habits. There are two main use cases for retailers: helping understand shopper movements to optimise marketing and displays, and integrating into other mobile solutions, such as consumer apps. In the case of the latter, it can be used to add an extra level of context to interactions, for example it can help to seal a sale by serving a user with a relevant ad at the right place and right time. The service is already live with a series of early test customers — including Singapore-based retailers Tangs, Perennial Malls and Dairy Farm Group — which have helped shape its development with feedback and suggestions. YFind co-founder Melvin Yuan tells TNW that other undisclosed deployments include “one of the largest malls in the world”, but the Singaporean examples are public because the government is backing the projects with investment to showcase them as examples of tech-led opportunities in the country. As part of the launch, Yuan is preparing to move to San Francisco in an initially “semi-permanent state” in response to the growth of new customers and business leads that YFind is generating in the US. “It makes a lot more sense to have someone in their time zone rather than working remotely,” he says, explaining that, in the long-term the company will look to branch out from Singapore with offices in the US and Hong Kong. “We’ve long stopped thinking about ourselves as a Singapore startup,” Yuan says, explain that the US, Middle East, Hong Kong and Southeast Asia are markets where YFind is fielding increasing numbers of requests. The company raised a SG$1.5 million (US$1.2 million) Series A round in June 2012, following a SG$750,000 ($610,000) government grant. Now “part of the future is to look for other kinds of fund raising”, in addition to growing the business, Yuan says. Plenty has happened in the indoor positioning space since that round, most notably Apple’s $20 million purchase of WiFiSLAM, a company that operates in the same space as YFind. That deal was generally seen as a sign of Apple’s interest in the indoor location space, and Yuan naturally argues that, while the technologies are similar, YFind is building a business that is considerably more developed than its rivals. Does that mean that they are targeting an acquisition? “Maybe, if the right company comes along and offers us the opportunity to take us somewhere where we’re not already, then we’d consider it,” he says. “We have a software solution to serve to retailers and marketers, we already have customers and we’re based in Asia, where we believe that we are quite unique and have access to sizeable markets. We ‘re taking our growth very seriously, and we think we would be an interesting acquisition,” he says. There is growing competition in the space, and YFind is not the only one to press home its value helping companies understand offline traffic and physical store visitors. We’ve previously written about Finland-based Walkbase, which uses a similar WiFi-power approach to monitoring consumers and integrates with Google Analytics to provide a snapshot of sales floor traffic. London-based Viewsy has a beta product to monitor ‘foot traffic’, Nomi provides similar in-store analytics, as does another WiFi-led solution from Elucid Analytics. YFind’s technology, and its potential to draw measurable insight about shoppers, has been interesting, and now that it is making a full launch in the US, it will be fascinating to see how the retail application is received by its target audience: retailers and malls. Primarily, Yuan is expecting to see growing sales in the US, which will lead to more US-based hires and a permanent office, although he says that product development will remain in Singapore for now. He doesn’t rule out moving into other verticals if there is sufficient interest, but for now retail is the company’s main focus. YFind is certainly setting out its stool to woo American retailers, and among its promotional materials are this slide deck and the below video, which make the technology and TheRetailHQ service easy to understand.